cuteapps: Personal Address File - A utility which can be used for keeping personal address information. ADDRFILE is a utility which can be used for keeping personal address information. For example, you can keep people's addresses, phone numbers, e-mail addresses, etc. This program is similar to the old Windows CARDFILE program and it can read (.CRD) files created by that program. You can use this program to keep personal notes too, just as you can use NOTEPAD for this purpose. However, by using this program, you can organize your data and access any information you need more easily. You can also optionally encrypt your data. Information is stored normally in CSV format, so you can import files created by ADDRFILE to other programs, like Microsoft Excel. However, you can save to and read from TXT files also. 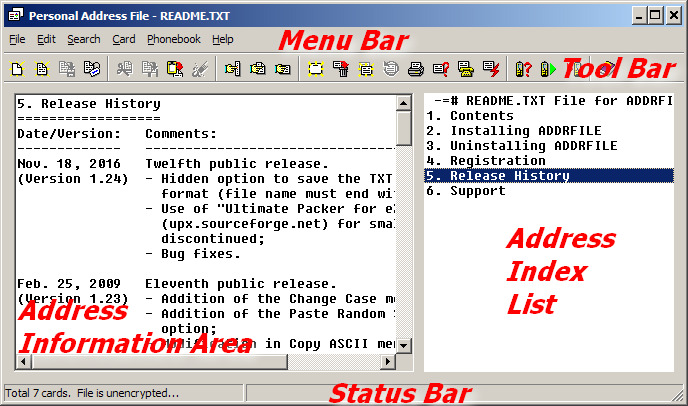 Finally, using ADDRFILE you can read and update phonebook entries of your mobile phone using serial, USB, or infrared connection to your PC. Sony Ericsson, Nokia, Motorola, and Siemens mobile phones are known to work with ADDRFILE. This program was written mainly to overcome some limitations of CARDFILE. For example, in CARDFILE the size of card cannot be larger than 12x40 characters including the index line. In ADDRFILE there is no such limitation. The main philosophy behind this program is its simplicity and easiness of use. Please refer to the README.TXT file. Don't have a lot of money to buy a building? You should not worry, just because it is available to take the business loans to solve such kind of problems. Thence take a consolidation loan to buy all you want.